James F Fallick was born at the Isle of Wight, England, in 1853. He arrived to NSW in 1876 after living for two years in New Zealand and moved to St Peters in 1881. He died Chatswood 1926. He was survived by his widow Elizabeth, one son and four daughters. His brother Alfred Fallick served on Newtown Council in 1873-78, and another brother Henry Fallick was on Kogarah Council from 1913 to 1922. James Fallick carried out some large contracts, including alterations to the Colonial Secretary s Office, the erection of St George’s Hall and the Trocadero at Newtown. James Fallick was a well-known bowler. James Fallick represented Newtown-St Peters as a Liberal candidate in the NSW Legislative Assembly in 1901-03. He represented Singleton in 1903-20. James Fallick was an alderman on Newtown Council in 1902-03, representing Enmore Ward. 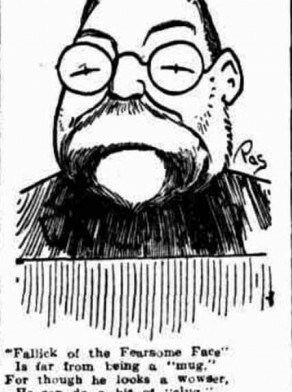 He won the election for extraordinary vacancy on 24 June 1902 after death of Dolman. He was the mayor of Macdonaldtown in 1884. In 1886 he was elected to St Peters Council and served as St Peters Mayor in 1888.